An image of what the Sandy Community Campus could be has come to fruition. 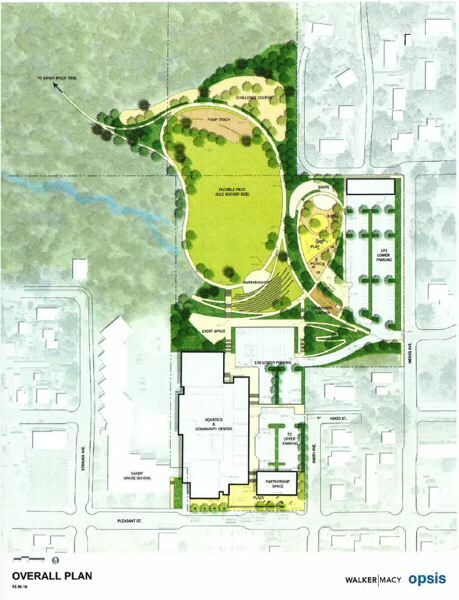 Consultants from OPSIS Architecture, along with City Manager Kim Yamashita, presented the concept for the old Cedar Ridge Middle School property at a City Council workshop on June 12. The 40-acre property has potential, according to OPSIS' plans, to be not only a community center but a multi-faceted park space. "It's not just a building," City Manager Kim Yamashita said. The Olin Y. Bignall Aquatic Center, though the city has grander renovations planned for it in the future, will be reopened at noon Thursday, July 5, for a recreational swim free of charge to the public. The city plans to keep the pool open seasonally until fall of 2019 then close for construction for about a year. The aquatic center was deemed early on in the planning process one of the "most valuable" parts of the property. So far the center has received a few different mechanical upgrades to make the facility "more efficient." Staff has had maintenance done on the HVAC system, the boiler upgraded, computers and new software installed and the slide and diving board removed because of safety concerns. "It's prioritized," said Tanya Richardson, city community services director. "We had a lot of people who wanted access to the pool as soon as possible. We're maintaining the current programming level. As we move forward, changes may occur due to staffing, but we want to expand our programming in the future as well." Normal programming, including classes and regularly scheduled swims will begin on July 9. Richardson said there has been "a very slight" cost increase for admission, but the city has also worked to create a fee structure that allows residents of Sandy to pay less than their non-resident counterparts. 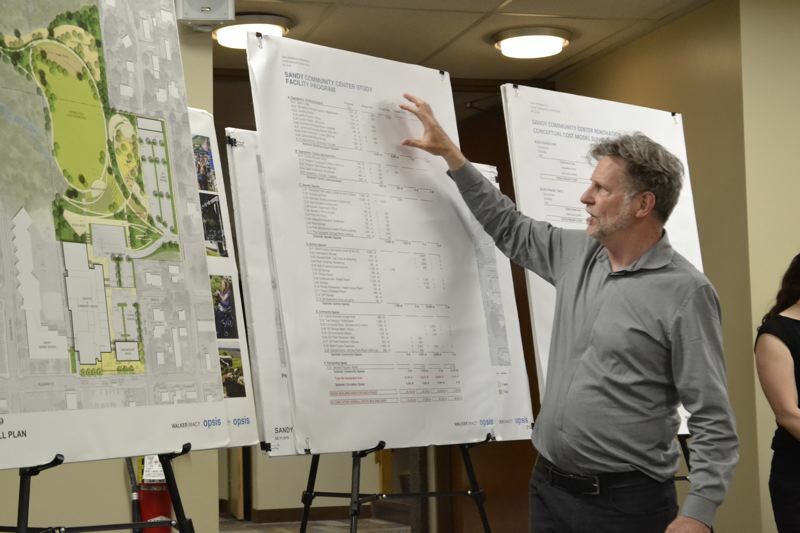 The rest of the campus project will be completed in phases, partially because of the enormity of the undertaking and partially because the total cost — about $72 million — is not an amount of money the city has to put down at one time. The initial funding will come from the city's urban renewal fund, and the city is working to apply for a grant from the Tony Hawk Foundation for the new proposed skate park. All of the components of the project and timing is conceptual at the moment. "The main school and gym will be demolished. The play structure, deemed unsafe, will come down as will the little portable in the front," Yamashita said. "The two-story (building) in the back will remain during phase one and phase two (of the project). Phase one is for complete redo of the pool, and some landscaping around where the buildings are removed. Some parking lot work, and addition of a classroom and admin office (will take place). The pool plumbing and pumps will be replaced. The kids' pool will be separated from the main pool's plumbing so it can be warmer and for sanitation issues. The shell of the building, locker rooms, lobby and mechanical will all be moved and replaced to get ready for phase two." As far as the park is concerned, the city has amassed quite a list of different amenities and uses the community would like to see the space offer, including a bike pump track, a new skate park, a bike skills course, a challenge course, open fields for club sports practices and games, a dog park, sheltered picnic areas, a community garden, trails and much more. The city still plans to host several open forums and presentations about the project to garner community feedback. During the Sandy Mountain Festival, Yamashita and Richardson will have an informational booth set up behind City Hall, 39250 Pioneer Blvd., from 4-8 p.m. Friday, July 13, and from 10 a.m. to 2 p.m. Saturday, July 14. They will also have a booth at the Sandy Music Fair and Feast in Centennial Plaza, 39295 Pioneer Blvd., from 11 a.m. to 1:30 p.m. Sunday, July 15.